Preparing for job interviews can sometimes be stressful! However, there's always a bit of relief to be felt when you actually feel prepared. Check out my top 6 interview tips that helped me secure the awesome job that I have today! Do your research: I can’t stress how important it is to have done your research before an interview! You should definitely understand what the company is about before you walk in those doors. Browse their website/blog and be able to refer back to things that you saw there during your interview. 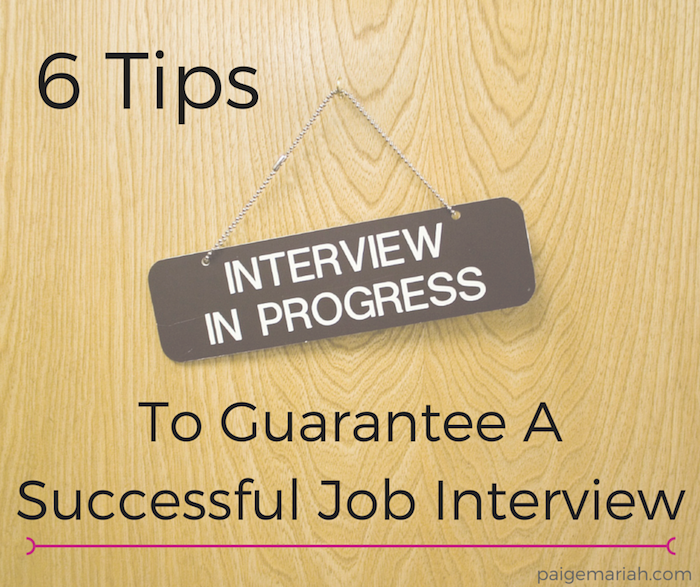 Not only will you appear prepared but the interviewer will also see that you’re interested in the company. Arrive on time: Do I really need to go into a further explanation about this? A late arrival has the potential to easily knock you out of the race. You never know what life will throw at you, so it’s better to just leave out early and allow yourself more travel time than necessary. Be yourself: It's usually super obvious when someone isn’t genuinely being themselves. Of course, it’s important to be professional at job interviews, but showing your unique personality will be the reason that you stand out among other candidates. I also wouldn’t suggest getting an entire makeover for an interview. Dress how you plan to once you’re hired. This is exactly why I chose to wear my natural hair to every interview because I knew that I wanted an employer that would have no problem with how I plan to normally wear my hair! Prepare by reviewing common interview questions: This has always been super helpful for me! There are so many lists out there with sample interview questions that are really great to practice with before an interview. Of course, you don’t want every answer to sound rehearsed…but having a few bullet points in your head of things you’d like to say can be super beneficial! Check out this list of 10 top interview questions on Levo. Always answer yes to “Do you have any questions for me?”: Super important! It never fails, after almost every interview, the interviewer will ask if you now have any questions for them. Always say yes! Even if you feel like they've told you everything that you could possibly ever know about the position and company, still ask a question. Not having any questions can actually make you appear uninterested or unprepared. Check out this awesome list of questions that you can ask in an interview by The Muse. Follow up with a thank you! : It’s best to send a personal thank you follow up email to your interviewer/s within 24 hours of your interview. At this point you’ll still be fresh on their minds and they’ll probably find it super thoughtful. Thank them for taking the time to meet with you and even go as far as to mention something that you really enjoyed discussing during your interview. The goal is always to make a lasting impression! I hope that you found these tips helpful! What’s one more thing that you would add to this list? Share in the comments! You have a job interview coming up, unsure how to walk, talk or answer questions? Here's some tips to put you on the right track, read on to your success!study about college paper editing,How can you prepare?Another of the tips for job interview is to know your interviewer's name, and to use it during the interview, for a familiar and personal touch.